« Blind Bartimaeus in the Gospel of Mark: Interpreted by the Gospel of John? Who Needs God to be Good? Pew Research Center surveyed 40,000 people across 40 countries between 2011 and 2013 to find what proportions of populations believe it is necessary to believe in God to be moral. The results (and explanation of how they conducted the survey) are online here. As probably expected, the more highly one is educated the less likely one is to believe that belief in God is necessary for morality. 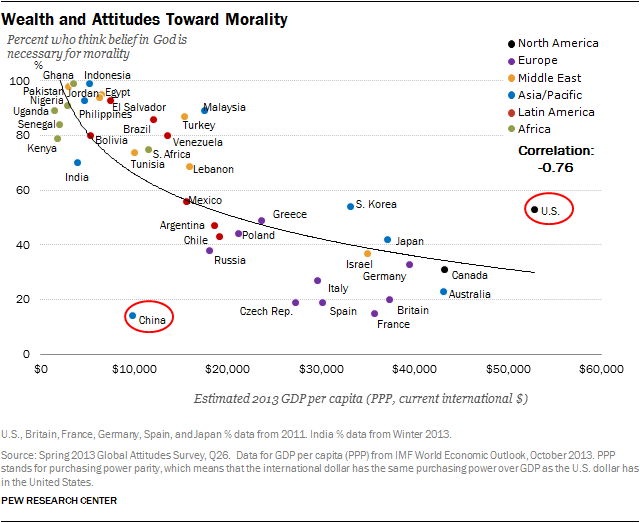 Also depressingly as expected, the USA is the exception among affluent nations, being the only such country where a majority of the population believes one can only be a moral person if one believes in God. Atheists be damned. Posted on 2014-03-18 21:17:50 GMT+0000 by Neil Godfrey. This entry was posted in Atheism, Ethics & Human Nature and tagged Belief in God, Pew Research Center, Religion and Spirituality. Bookmark the permalink. I can see the statistics on wealth and morality being used by some religious folk to say that money has corrupted these countries (not entirely untrue) and that is why the rich countries say a god is unnecessary for morality. Of course to have money in the first place, you need services, and for better services (certainly for high GDP) you need a better standard of education; no point setting up a chemical process plant if the people working for you can’t produce the goods. So the next stats to check might be those comparing crime and various social dysfunctional indicator stats between the affluent and the rest. Now that would tell the story, I suggest. America is such an embarrassment. This is why I blog anonymously — professional detriment to be viewed as immoral.